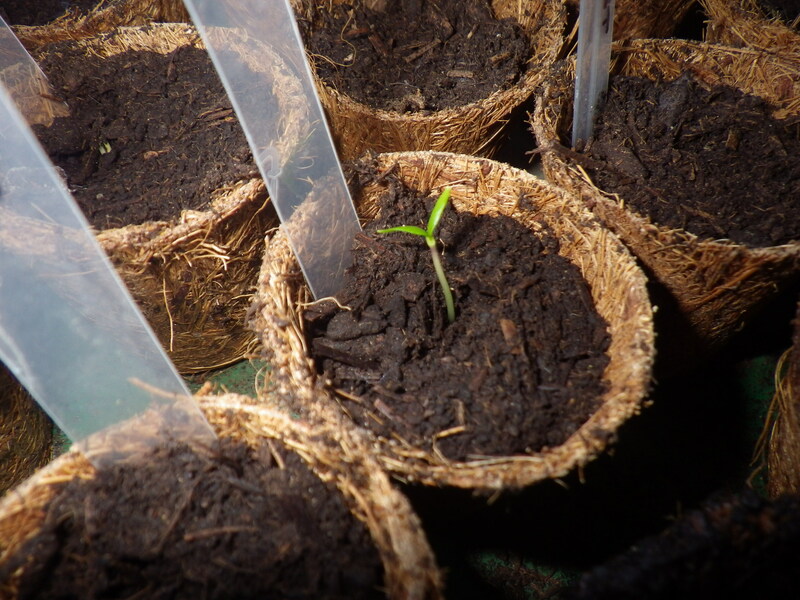 As part of my PhD research, I studied the germination of various seeds – both herbaceous plants and tree species. One thing that I learned was how many species have build-in dormancy. 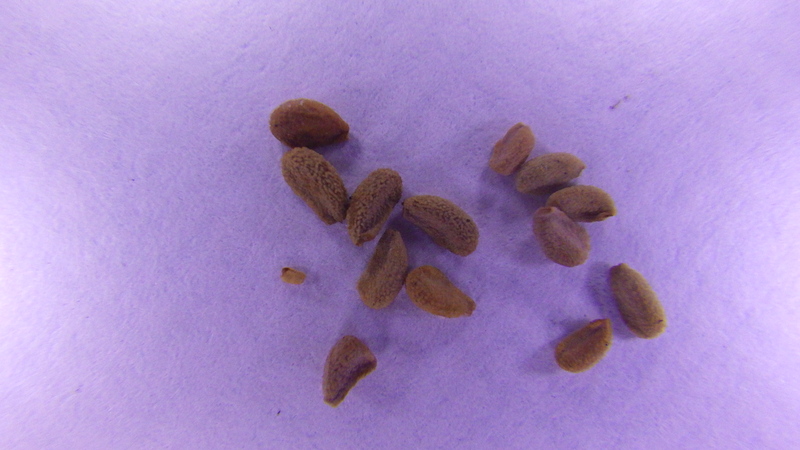 The fleshy parts of the fruit may have to rot away before germination can take place, or be digested within the gut of a bird or mammal; the hard outer coat may need to be physically broken down (scarification); or the seed may need to have been exposed to cold (cold stratification). These are all ways to ensure that germination takes place away from the parent plant and/or at the right time of year. In temperate regions, the latter is particularly common – guaranteeing that the seed germinates after the winter rather than before. Some seeds employ multiple mechanisms and some are particularly fussy (I never managed to get a bluebell seed to germinate, for example). All my experience means that I knew that the sludge left over from my peach scrap vinegar contains the ingredients I need to grow peach trees… namely, peach pits free from any fruit flesh. The key thing now is that they need to be exposed to cold conditions for a few weeks. So, the other day, after I had strained off the liquid that will turn into vinegar, I fished out some of the stones, washed off the last vestiges of flesh, placed them in damp compost and transferred them to the refrigerator (making use of a plastic box that had previously contained slices of tortilla from our wonderful local Spanish deli… yes, I know I should have taken my own box, but it was an impulse buy because the smell was so good). Here they will stay for at least six weeks before being brought out and placed in the limery. 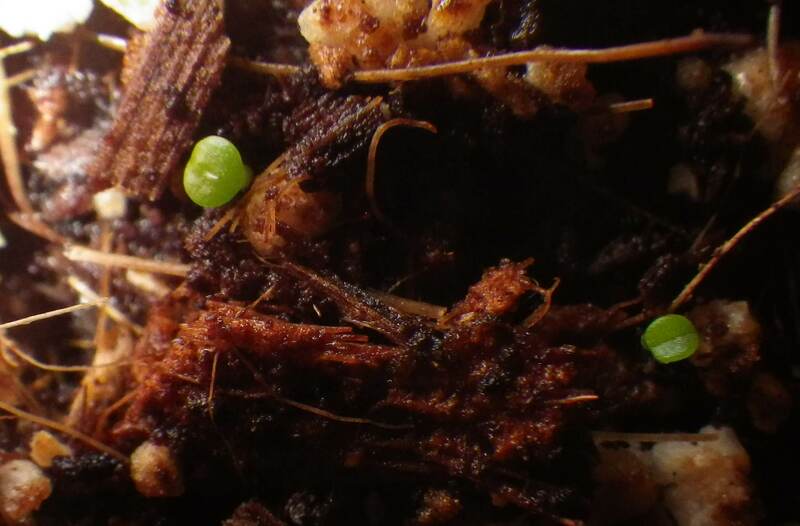 Even then, it could take many months before any of them germinate. On the same subject, I received some Sarracenia seeds as a free gift when I ordered my new carnivorous plants. 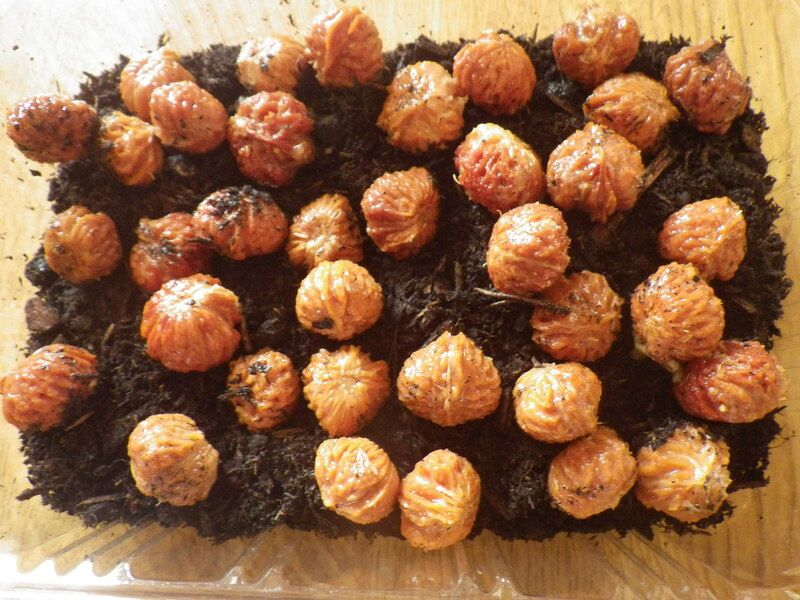 I checked their germination requirements and discovered that they too require chilling, so they have joined the peach pits in damp compost in the bottom of the fridge (this time in a plastic box that had contained strawberries from our local organic farm). Whether these seeds will germinate successfully remains to be seen, but I love the optimism associated with sowing them… especially since each was a bonus as a result of another action. It may still be winter outside, but indoors there are the first signs of spring. [They] make a bush about 20″ tall, covered in incredibly purple little peppers. They then ripen to a whole range of pinks, oranges and reds, so you get all the colours at the same time. It is ideal as a patio or conservatory pot plant, and is very hot, too! I bought them mainly because I thought they would look pretty, but I’m sure that we will enjoy the chilli peppers in cooking. 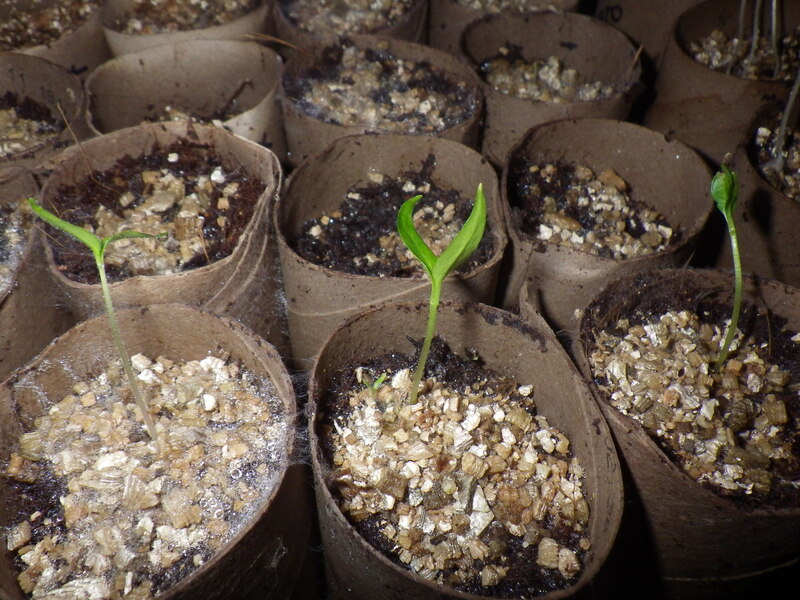 Second to appear is a tiny shoot of Bartlett’s Bonnet chilli, again from Real Seeds and selected because the fruit are such an interesting shape, described as a “winged bell”. Apparently the plants can grow up to four feet tall… at the moment only the tiniest loop of stem is peaking out from the compost and you might not even be able to spot it, but trust me it’s there. 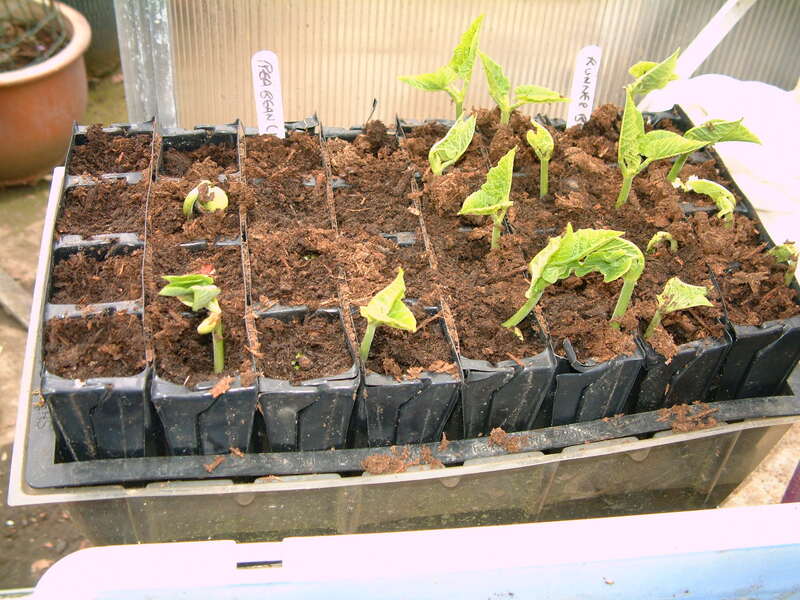 So, we have ‘chilli futures’ and ‘potato futures’, fingers crossed we’ll start to see some sweet peppers germinating soon too. The pots, by the way, are hand made in Sri Lanka from coir fibre and latex (read about them here), the compost is made commercially using wool and bracken (details here) and I made the plant labels from strips of plastic cut from the lids of some old takeaway boxes. They are tiny (about half a millimetre across at the moment) and I can only see three in total, but it looks like I’ve got my very own living stones! Woohoo! Sometimes you should grow things for the pure joy of it. For the past four days we have had sunshine and no rain! It’s cloudy now, but the forecast is for more sunshine over the next few days. This is great news because the winter of 2012/13 has, so far, been very gloomy. Every day we record the amount of electricity that our solar panels generate, so we have a ready means of comparing sunshine between years. These past few months have been rather darker than the equivalent periods in the past two years, so the recent weather has been particularly welcome. 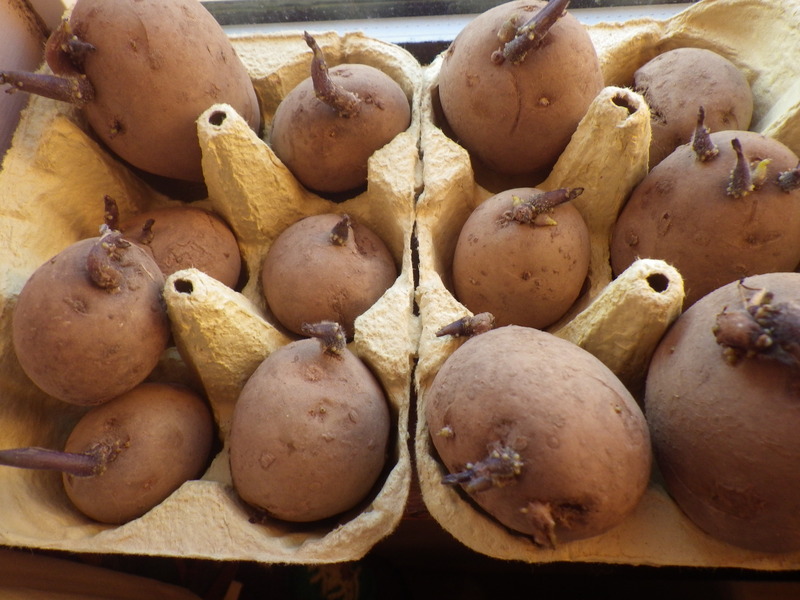 It’s not just us people who have been suffering from the dark – the winter vegetables have been struggling. Our leeks, purple and white sprouting broccoli and oriental greens are much smaller than we had hoped and I don’t even want to think about the kale. Fingers crossed that they will put on a spurt of growth as a result of all the recent photosynthesis. To be fair, the white sprouting broccoli is supposed to be a very late variety, so I wouldn’t expect much from it yet, but the purple is described as ‘early’. 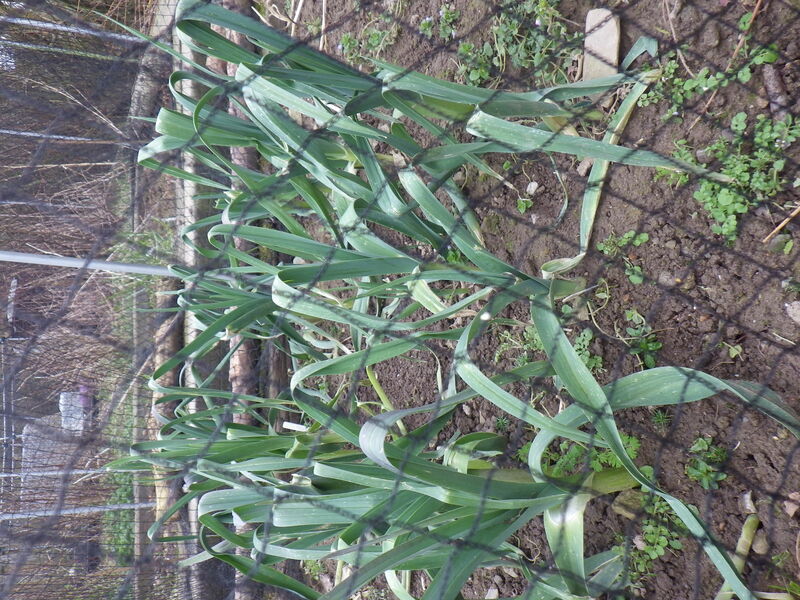 The sunshine does seem to have encouraged some growth from the garlic and onion sets that were planted some time ago… I was beginning to think that they might have drowned! However, there is a whole growing season to look forward to in 2013. 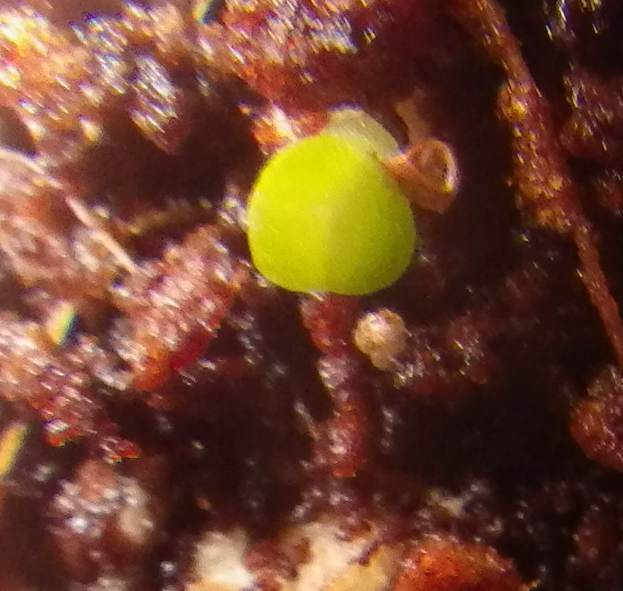 The first batch of seeds that I planted earlier this month have started to germinate, and this is always a good feeling. 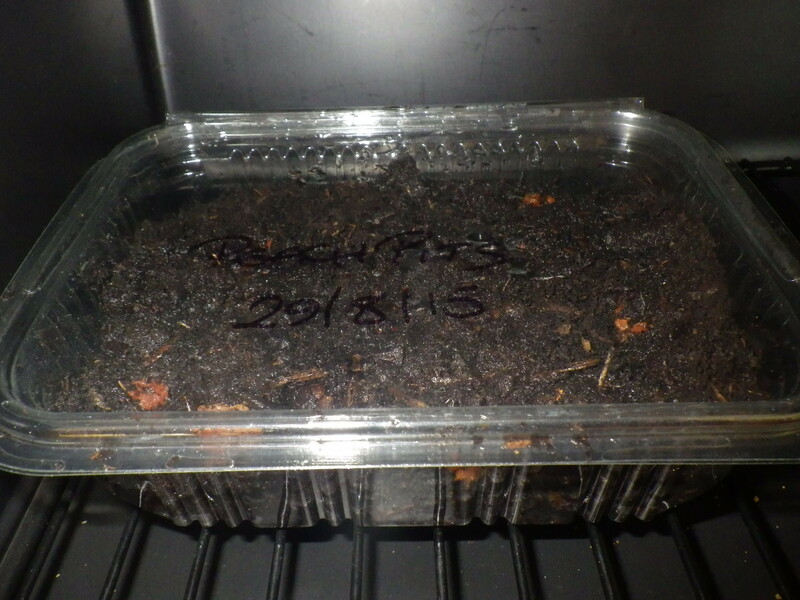 I use an electric propagator to get peppers and chillies started early in the year. In my experience, they need a long growing season and do best if sown in January or February. Most capsicums germinate best in the UK if they have some gentle heat applied, otherwise they simply don’t do anything or even just rot. I gather that the optimum temperature is in the range 20-30°C (68-86°F), but my experience is to aim for the upper end of this. The only things I have sown so far are the capsicums (hot and sweet), basil (for an early crop grown indoors) and tomato and tomatillo. One year I sowed courgettes and squashes in February, but I just ended up with leggy plants that I couldn’t transplant outside because there was still a risk of frost. In the end my crop was relatively poor because by the time I could put them in to soil they were too tender and thus prone to slug attack. Mind you, that was in the days before the chickens when our slug problem was much worse. Anyhow, the curcurbits will wait a while before sowing… I will just have to enjoy watching the things I have up and running and getting some “Wizard” field beans in soon now it appears they won’t either rot or float away! When I started writing my post ‘Variety is the spice of life’ last weekend, my intention was to write about ‘varieties’ and somehow ended up at a slightly higher taxonomic level writing a bit about the range of vegetables/fruit that I grow. Today, however, my thoughts are turning to all the choice of varieties there are… or aren’t… available to us. To be able to sell vegetable seeds in the UK, they must appear on the ‘National List’. Until recently this was a very costly process, but last year the regulations changed and now, I understand, it is possible to list an ‘Amateur Vegetable Variety’** for a fee of £100. Such varieties are those grown by gardeners and deemed to have ‘no intrinsic value for commercial production‘. This has helped us ‘amateurs’ to access a variety of seeds without breaking the law, but I would still encourage you to support the Heritage Seed Library run by Garden Organic (formerly the Henry Doubleday Research Association), who have done a fantastic job for many years acting as guardians of varieties that would otherwise have been lost. So, why should we be interested in different varieties of seed? What’s wrong with the ones that the big seed houses sell? Well, first of all, listing seeds used to be a very expensive business, so the only varieties that were on the list were the ones that made money commercially… because they were valuable crops in one way or another. 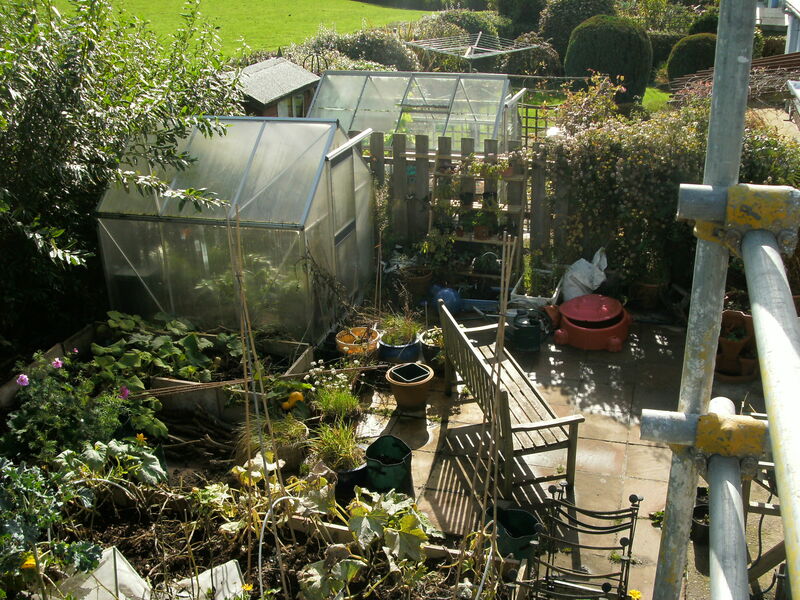 Something that’s good as a large-scale crop isn’t necessarily the best thing for your garden. It might be, for example, that the farmer wants a crop that is uniform in appearance or that isn’t readily damaged during transportation. But as a gardener, these are likely to be irrelevant – it’s likely to be more important that our variety tastes good or has a long season. The latter may be really inconvenient for a farmer who wants a single harvest. The second key point is that seed houses want you to buy seed from them every year. What better, then, than the expensive F1 hybrids, which do not breed true? You can’t save the seeds from these and know what you will get next year, so you are tied into a never-ending relationship with the seed seller. The Real Seeds folk, in contrast, send seed-saving instructions with your seeds in a deliberate attempt to do themselves out of business!! And then. there is the joy of supporting a small business that sells seeds produced on a small-scale – why shouldn’t it be possible to produce just a little seed each year and make a little money on it without being a criminal? I have loved some of the varieties that I have grown over the years… crimson flowered broad beans are a particular favourite that only used to be available from the HSL, along with Greek squash, Salt Spring Sunrise tomato, bronze arrow lettuce, asparagus kale… I could go on. I’m on the lookout for new friends… perennial kale has promise according to Esculent et cetera. In many cases, we have had wonderful flavours from our less usual varieties (as promised by the quote at the top!) as well as beauty… from beans, squashes and mangetout, in particular. We’ve also seen our crops attract large numbers of pollinating insects because traditional varieties tend to be more accessible to them. So, why not try some of the less commercial varieties? Another little step on the path to sustainability. ** I’m amused by the concept of an ‘amateur vegetable’… does it have a day-job and is it just a vegetable in its spare time? I did not visit my greenhouse yesterday because I was away attending a tutorial (more about that in later posts), so when I got up to let the chickens out this morning I thought that I would just go and say hello to the seedlings. All is well with chillies, peppers, courgettes, squashes, leeks, tomatoes and melons, but what about the beans? 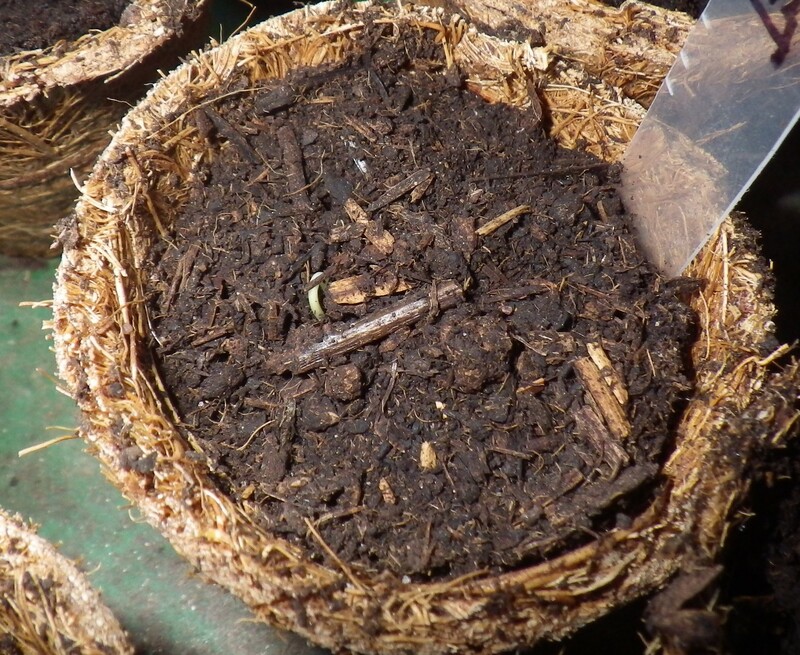 There are some signs of life from the runner beans, a couple of green shoots appearing and the tops of some seeds emerging at the surface, pushed up by the roots that must be growing below.